My life, when it is written, will read better than it lived. Henry Fitz-Empress, first Plantagenet, a king at twenty-one, the ablest soldier of an able time. He led men well, he cared for justice when he could and ruled, for thirty years, a state as great as Charlemagne’s. He married out of love, a woman out of legend. Not in Alexandria, or Rome, or Camelot has there been such a queen…. Christmas 1183. What should have been a joyous family occasion turned into a bitching-fighting tragedy. Like every year, King Henry II has reunited his family: his formidable wife, Eleanor of Aquitaine, whom he keeps locked up in prison the rest of the time, and their three living sons, Richard, the eldest and Eleanor’s favourite; John, the youngest and Henry’s favourite; and Geoffrey, the middle son no one wants. What all the brothers want, though, is to be king, and with Eleanor now free to plot to put her favourite on the throne, against Henry’s wishes (he’d like to be succeeded by his beloved but incompetent youngest son), the holidays become an occasion for Henry to face the past, the way he’s lived his life, and how his deeds and mistakes will impact the future once he’s gone. Straight away, Henry and Eleanor start playing the old game so beloved by estranged spouses of who can hurt the other more. To do it, they don’t hesitate to use their sons (who in their turn, plot with the French King Philip II, then at the English court to discuss the betrothal of his sister Alais), Henry’s mistress and Richard’s betrothed Alais (who had been raised by Eleanor like if she had been her own daughter; are you getting an headache now? ), hurtful and probably false revelations about past affairs, and every other means at their disposal. In the end, Henry decides that he’s had enough of his family. He’s determined to get an annulment, declare their sons bastards, and get married to his mistress so that he can father more docile sons. Eleanor, of course, cannot allow this. 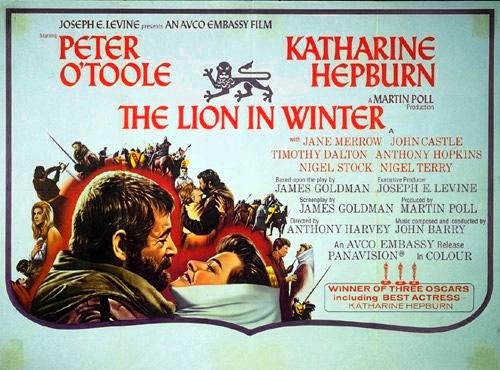 The Lion In Winter perfectly capture the tempestuous relationship between the royal couple. But while they were busy outwitting each other, and scheming for power, loss of which, as Eleanor all too well knew, could lead to imprisonment and death, is clear that the two still have feelings for each other. And yet they can’t help but hurt each other at any given opportunity. How can such a strong and powerful love as theirs turn to such distrust and hate? That’s the question that haunts Henry and, especially, Eleanor. And what’s even worse s that they both know that it’s too late to go back. Too much has happened in the past and, now that they’ve embarked on this destructive course, they must follow it to its very bitter end. Katharine Hepburn, which played Eleanor, and Peter O’Toole, who gave life to Henry, were absolutely brilliant. Their performances were amazing, and so gut-wrenching. Both Eleanor and Henry were two formidable characters, and both actors stepped up to the challenge brilliantly, bringing to life both their strengths and vulnerabilities. Anthony Hopkins (Richard), John Castle (Geoffrey), and Timothy Dalton (Philip) were all great too. Instead, I found the performances of Nigel Terry, who played the annoying and useless John, and Jane Merrow, who played the dull Alais, less convincing. Merrow, in particular, was just ok. But maybe that just helps to emphasize how boring and safe Alais was compared to Eleanor and why, in his last years, Henry would find such a woman attractive. 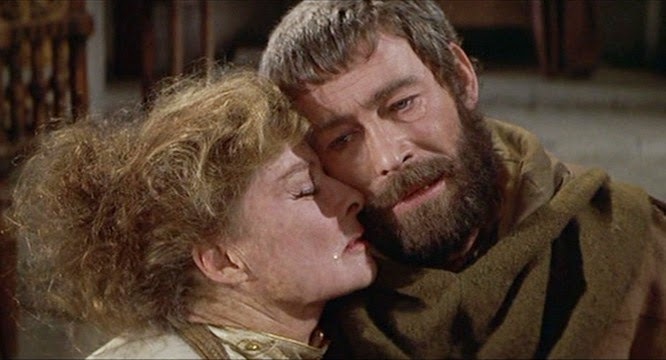 Although The Lion In Winter is clearly set in the past, with costumes and settings that recreate the medieval era quite faithfully, the story feels very modern. The struggle between the family members is something that most viewers will be able to relate to. That, together with Hepburn and O’Toole’s performances, makes this movie a must-watch.